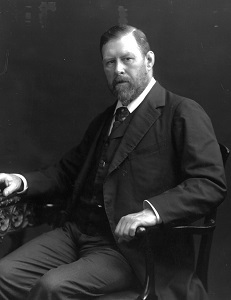 Abraham Stoker was born in Dublin in 1847 and is best remembered for his 1897 novel Dracula. Dracula’s Guest is believed to be a discarded chapter from the novel and the story centres on an unnamed Englishman, probably Jonathan Harker, who has a frightening experience in a remote graveyard on Walpurgis nacht. He crossed himself, as he answered laconically: “Walpurgis nacht.” Then he took out his watch, a great, old-fashioned German silver thing as big as a turnip and looked at it, with his eyebrows gathered together and a little impatient shrug of his shoulders. I realized that this was his way of respectfully protesting against the unnecessary delay and sank back in the carriage, merely motioning him to proceed. He started off rapidly, as if to make up for lost time. Every now and then the horses seemed to throw up their heads and sniff the air suspiciously. On such occasions I often looked round in alarm. The road was pretty bleak, for we were traversing a sort of high windswept plateau. As we drove,I saw a road that looked but little used and which seemed to dip through a little winding valley. It looked so inviting that, even at the risk of offending him, I called Johann to stop–and when he had pulled up, I told him I would like to drive down that road. He made all sorts of excuses and frequently crossed himself as he spoke. This somewhat piqued my curiosity, so I asked him various questions. He answered fencingly and repeatedly looked at his watch in protest. Whereupon he burst out into a long story in German and English, so mixed up that I could not quite understand exactly what he said. Roughly I gathered that long ago, hundreds of years, men had died there and been buried in their graves; but sounds were heard under the clay, and when the graves were opened,men and women were found rosy with life and their mouths red with blood. And so, in haste to save their lives (aye, and their souls!–and here he crossed himself)those who were left fled away to other places, where the living lived and the dead were dead and not–not something. He was evidently afraid to speak the last words. As he proceeded with his narration, he grew more and more excited. It seemed as if his imagination had got hold of him, and he ended in a perfect paroxysm of fear–white-faced, perspiring, trembling, and looking round him as if expecting that some dreadful presence would manifest itself there in the bright sunshine on the open plain. I sat down to rest myself and began to look around. It struck me that it was considerably colder than it had been at the commencement of my walk–a sort of sighing sound seemed to be around me with, now and then, high overhead, a sort of muffled roar. Looking upwards I noticed that great thick clouds were drafting rapidly across the sky from north to south at a great height.There were signs of a coming storm in some lofty stratum of the air. I was a little chilly, and, thinking that it was the sitting still after the exercise of walking, I resumed my journey. There was something so weird and uncanny about the whole thing that it gave me a turn and made me feel quite faint. I began to wish, for the first time, that I had taken Johann’s advice. Here a thought struck me, which came under almost myssterious circumstances and with a terrible shock. This was Walpurgis Night! Walpurgis Night was when, according to the belief of millions of people, the devil was abroad–when the graves were opened and the dead came forth and walked. When all evil things of earth and air and water held revel. This very place the driver had specially shunned. This was the depopulated village of centuries ago.This was where the suicide lay; and this was the place where I was alone–unmanned, shivering with cold in a shroud of snow with a wild storm gathering again upon me! It took all my philosophy, all the religion I had been taught,all my courage,not to collapse in a paroxysm of fright. And now a perfect tornado burst upon me. The ground shook as though thousands of horses thundered across it; and this time the storm bore on its icy wings, not snow, but great hailstones which drove with such violence that they might have come from the thongs of Balearic slingers–hailstones that beat down leaf and branch and made the shelter of the cypresses of no more avail than though their stems were standing corn. At the first I had rushed to the nearest tree;but I was soon fain to leave it and seek the only spot that seemed to afford refuge, the deep Doric doorway of the marble tomb. There, crouching against the massive bronze door, I gained a certain amount of protection from the beating of the hailstones, for now they only drove against me as they ricochetted from the ground and the side of the marble. As I leaned against the door, it moved slightly and opened inwards. The shelter of even a tomb was welcome in that pitiless tempest and I was about to enter it when there came a flash of forked lightning that lit up the whole expanse of the heavens. In the instant, as I am a living man, I saw, as my my eyes turned into the darkness of the tomb, a beautiful woman with rounded cheeks and red lips, seemingly sleeping on a bier. As the thunder broke overhead, I was grasped as by the hand of a giant and hurled out into the storm. The whole thing was so sudden that, before I could realize the shock, moral as well as physical, I found the hailstones beating me down. At the same time I had a strange, dominating feeling that I was not alone. I looked towards the tomb. Just then there came another blinding flash which seemed to strike the iron stake that surmounted the tomb and to pour through to the earth, blasting and crumbling the marble, as in a burst of flame. The dead woman rose for a moment of agony while she was lapped in the flame, and her bitter scream of pain was drowned in the thundercrash. The last thing I heard was this mingling of dreadful sound,as again I was seized in the giant grasp and dragged away, while the hailstones beat on me and the air around seemed reverberant with the howling of wolves. The last sight that I remembered was a vague, white, moving mass,as if all the graves around me had sent out the phantoms of their sheeted dead, and that they were closing in on me through the white cloudiness of the driving hail. Gradually there came a sort of vague beginning of consciousness, then a sense of weariness that was dreadful. For a time I remembered nothing, but slowly my senses returned. My feet seemed positively racked with pain, yet I could not move them. They seemed to be numbed. There was an icy feeling at the back of my neck and all down my spine, and my ears, like my feet, were dead yet in torment; but there was in my breast a sense of warmth which was by comparison delicious.It was as a nightmare–a physical nightmare, if one may use such an expression; for some heavy weight on my chest made it difficult for me to breathe. This period of semilethargy seemed to remain a long time, and as it faded away I must have slept or swooned. Then came a sort of loathing, like the first stage of seasickness, and a wild desire to be free of something–I knew not what.A vast stillness enveloped me, as though all the world were asleep or dead–only broken by the low panting as of some animal close to me. I felt a warm rasping at my throat, then came a consciousness of the awful truth which chilled me to the heart and sent the blood surging up through my brain. Some great animal was lying on me and now licking my throat. I feared to stir, for some instinct of prudence bade me lie still; but the brute seemed to realize that there was now some change in me, for it raised its head. Through my eyelashes I saw above me the two great flaming eyes of a gigantic wolf. Its sharp white teeth gleamed in the gaping red mouth, and I could feel its hot breath fierce and acrid upon me. For another spell of time I remembered no more. Then I became conscious of a low growl, followed by a yelp, renewed again and again. Then seemingly very far away, I heard a “Holloa! holloa!” as of many voices calling in unison. Cautiously I raised my head and looked in the direction whence the sound came, but the cemetery blocked my view. The wolf still continued to yelp in a strange way, and a red glare began to move round the grove of cypresses, as though following the sound. As the voices drew closer, the wolf yelped faster and louder. I feared to make either sound or motion. Nearer came the red glow over the white pall which stretched into the darkness around me. Then all at once from beyond the trees there came at a trot a troop of horsemen bearing torches. The wolf rose from my breast and made for the cemetery. I saw one of the horsemen (soldiers by their caps and their long military cloaks) raise his carbine and take aim. A companion knocked up his arm,and I heard the ball whiz over my head. He had evidently taken my body for that of the wolf. Another sighted the animal as it slunk away, and a shot followed. Then, at a gallop, the troop rode forward–some towards me, others following the wolf as it disappeared amongst the snow-clad cypresses. As they drew nearer I tried to move but was powerless, although I could see and hear all that went on around me. Two or three of the soldiers jumped from their horses and knelt beside me. One of them raised my head and placed his hand over my heart. “What was it?” was the question, asked in all manner of keys.The answer came variously and all indefinitely as though the men were moved by some common impulse to speak yet were restrained by some common fear from giving their thoughts. “It–it–indeed!” gibbered one, whose wits had plainly given out for the moment. “Serve us right for coming out on this night!Truly we have earned our thousand marks!” were the ejaculations of a fourth. The officer raised me to a sitting posture, as he uttered a word of command; then several men placed me upon a horse.He sprang to the saddle behind me, took me in his arms, gave the word to advance; and, turning our faces away from the cypresses, we rode away in swift military order. I was then mounted behind a trooper, and we rode on into the suburbs of Munich. Here we came across a stray carriage into which I was lifted , and it was driven off to the Quatre Saisons–the young officer accompanying me, whilst a trooper followed with his horse, and the others rode off to their barracks. When we arrived, Herr Delbruck rushed so quickly down the steps to meet me, that it was apparent he had been watching within. Taking me by both hands he solicitously led me in.The officer saluted me and was turning to withdraw, when I recognized his purpose and insisted that he should come to my rooms. Over a glass of wine I warmly thanked him and his brave comrades for saving me. He replied simply that he was more than glad, and that Herr Delbruck had at the first taken steps to make all the searching party pleased; at which ambiguous utterance the maitre d’hotel smiled, while the officer plead duty and withdrew. Bistritz. Be careful of my guest–his safety is most precious to me. Should aught happen to him, or if he be missed, spare nothing to find him and ensure his safety. He is English and therefore adventurous. There are often dangers from snow and wolves and night. Lose not a moment if you suspect harm to him. I answer your zeal with my fortune. –Dracula. As I held the telegram in my hand,the room seemed to whirl around me,and if the attentive maitre d’hotel had not caught me,I think I should have fallen. There was something so strange in all this, something so weird and impossible to imagine, that there grew on me a sense of my being in some way the sport of opposite forces–the mere vague idea of which seemed in a way to paralyze me. I was certainly under some form of mysterious protection. From a distant country had come, in the very nick of time, a message that took me out of the danger of the snow sleep and the jaws of the wolf.